I'm a fan of Pat Flynn. If you haven't listened to his Smart Passive Income podcast, and you have any interest in being self-sufficient without "working for the man", Pat's podcast would be a good start. 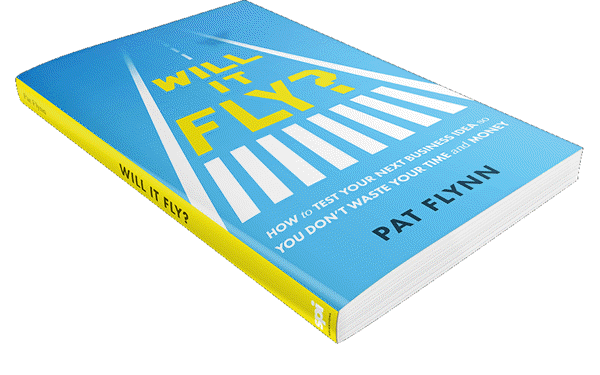 Pat has people ask him about ideas though and he's put his ideas on how to work out if an idea is worth pursuing in his book: Will It Fly? How to Test Your Next Business Idea So You Don't Waste Your Time and Money. People often have what they think are great ideas but they don't know if they really are good ideas or not. The lousy situation is where they then invest a great deal of money building/creating something, only to watch it fail miserably in the market. Pat's book is designed to help to avoid that. Pat is a thought leader in this part of the market. And he's done very, very well from his work. Ironically, it all started because he lost his "real" job. In this book, he helps you through the steps of what to do before launching (or particularly before investing heavily) in your business idea. Entrepreneurship is hard, but it can also be very rewarding. That's a scary concept for many. So often, people live from pay to pay, or have such heavy commitments, that they feel they really have few options. I can't say that I miss doing a "normal" job and I can't imagine ever wanting to do one again, no matter what happens. I wish this book had been available decades ago. It would have saved me a lot of time and effort along the way. This book won't help you decide if you should be an entrepreneur. But if you've decided to do so, this book is great material for anyone looking to start a business, launch a product, or even change tack in their current business.